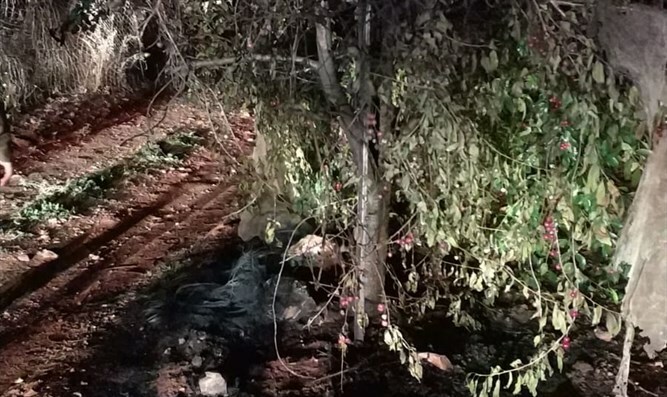 Palestinian Authority Arabs set fire to Jewish cherry orchard, steal tons of cherries. Just ahead of Gush Etzion's annual cherry-picking festival, Palestinian Authority (PA) Arabs set fire to the cherry trees in the Kfar Etzion kibbutz. The fire raged for a long time before firefighters succeeded in controlling it, and left significant damage in its wake. This fire is the latest in a long list of recent arsons, set by PA Arabs to Jewish land. In addition, PA Arabs have stolen dozens of tons of cherries from the orchards. Gush Etzion Regional Council Head Shlomo Ne'eman said, "We are witness to repeated and organized attacks by Arab rioters on Jewish agriculture. This is not about bored teenagers. It seriously harms the nation of Israel and Israeli sovereignty." "It is inconceivable that a Jewish farmer should not be able to work his land. These rioters continue their traditional attempts to banish Gush Etzion's Jews from their land, and our unashamed response is that they will continue to see us here, standing up for our values and living on our land forever. "State authorities, led by the court which only a few weeks ago released an agricultural terrorist who harmed Israeli agriculture and was arrested after much effort by our forces, need to work immediately to apply the rule of law. Kfar Etzion, and Gush Etzion's farmers, are not a free-for-all."